Step-by-Step: 1. Preheat the oven to 350 degrees. 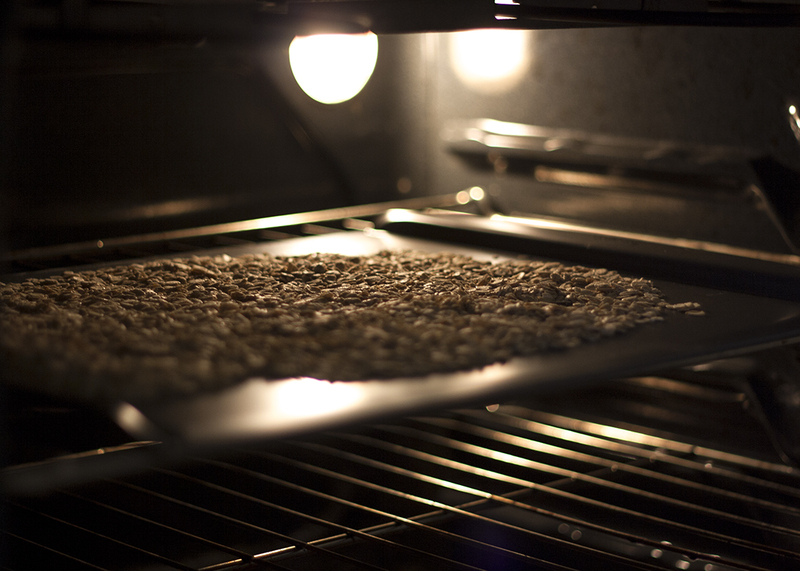 Spread the oats evenly on a cookie sheet and bake in the oven for about 12-13 minutes, or until they are golden brown and smell nutty and delicious. 2. 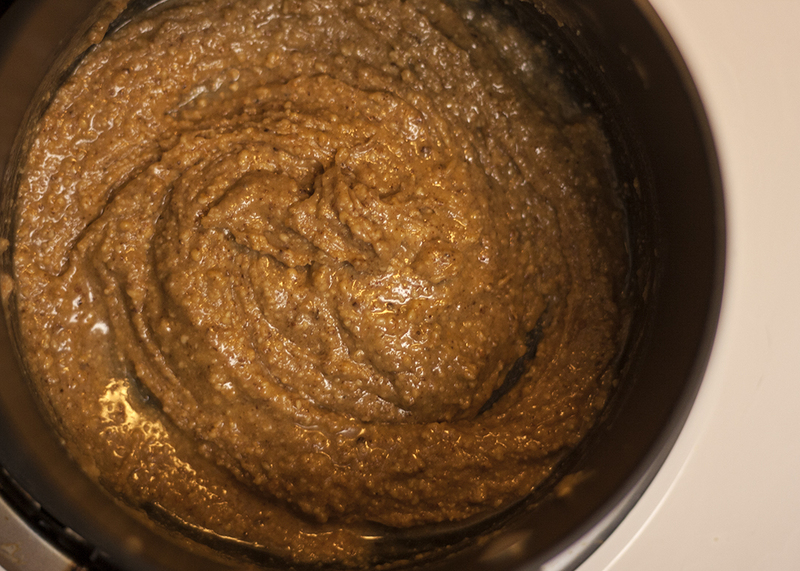 Chop the dates in a food processor until they form a sticky and fairly smooth consistency. The dates should stick together like a ball of cookie dough. 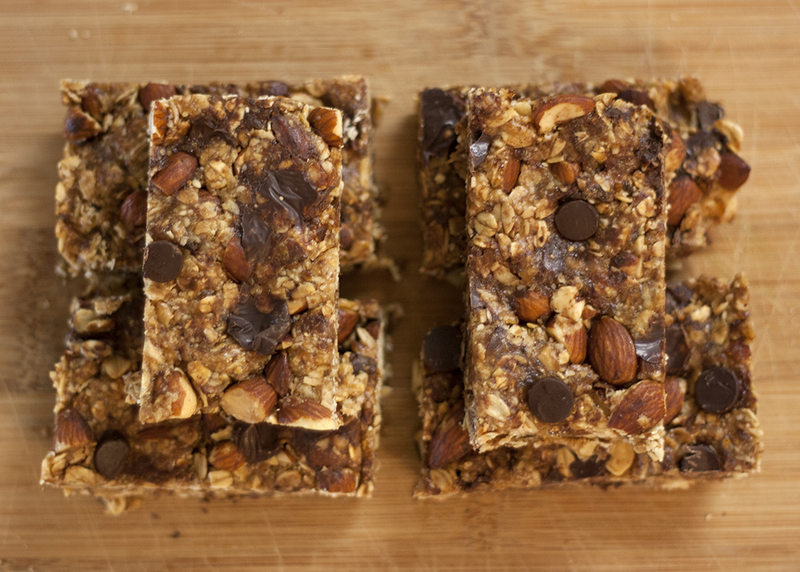 If you don’t have a food processor, you could technically use a blender instead – we attempted this the first time we made this recipe, and ended up buying a food processor specifically to make these bars again. The blender was a little challenging and I was worried we would burn out the motor. Those dates are sticky! 3. 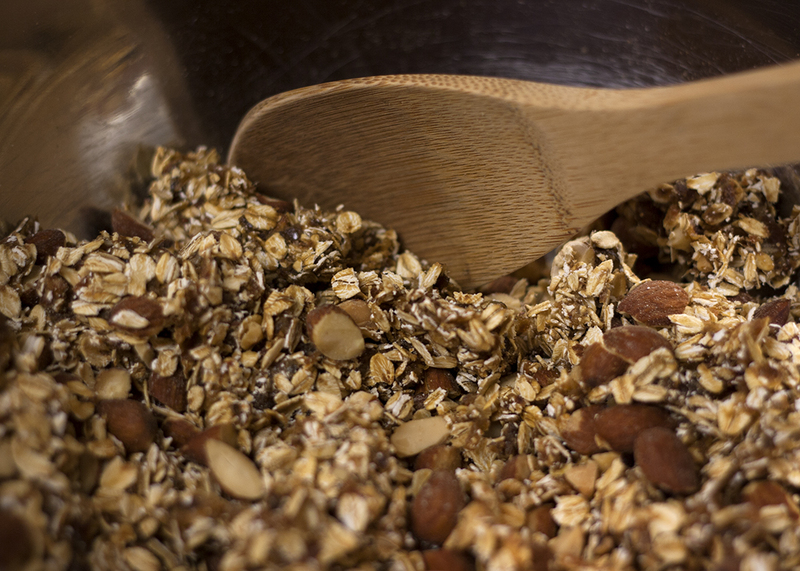 In a medium or large bowl, mix together the toasted oats, chopped almonds, and chopped dates. Don’t overwork them so much so that you crush the oats, but blend the ingredients a bit. 4. 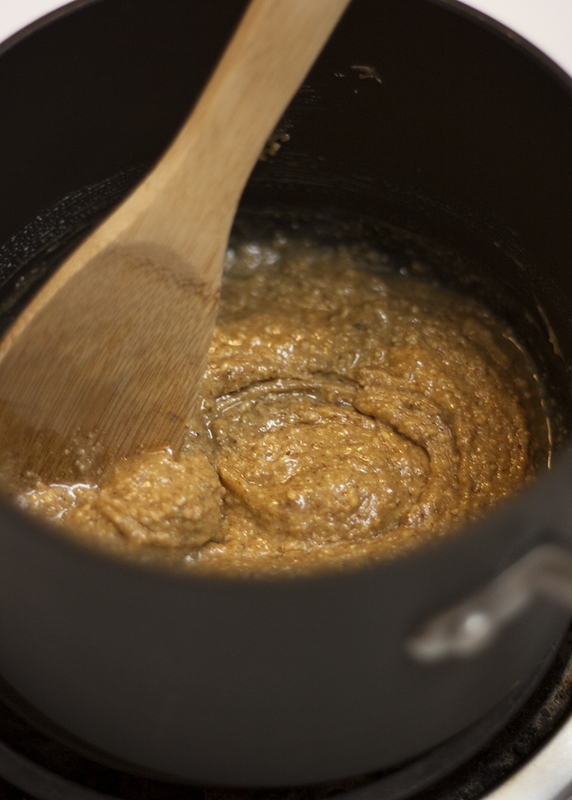 In a small saucepan, warm the almond butter and honey over low heat. 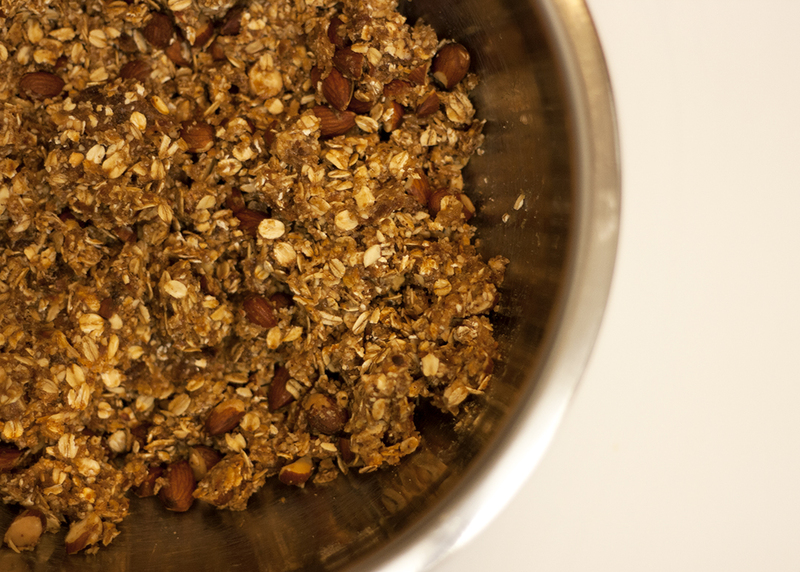 Stir until the butter and honey are smooth and well-blended, then pour into the bowl with the dates, nuts, and oats. Using a spoon and then your (clean) hands, incorporate the ingredients togethers thoroughly. It will be sticky, but that’s what makes it fun! 5. Set the mixture aside for about five minutes or so to let it cool. Once it’s cool enough that the chocolate chips won’t totally melt (feel free to test a few), mix in the chocolate chips. 6. Line a baking dish with parchment paper, with the paper sticking up over the edge of the dish so it is easy to lift out. You can use an 8×8 dish – we used a smaller rectangular dish that’s about 10×7. Press the bar mixture into the pan until it’s tight and compact. 7. 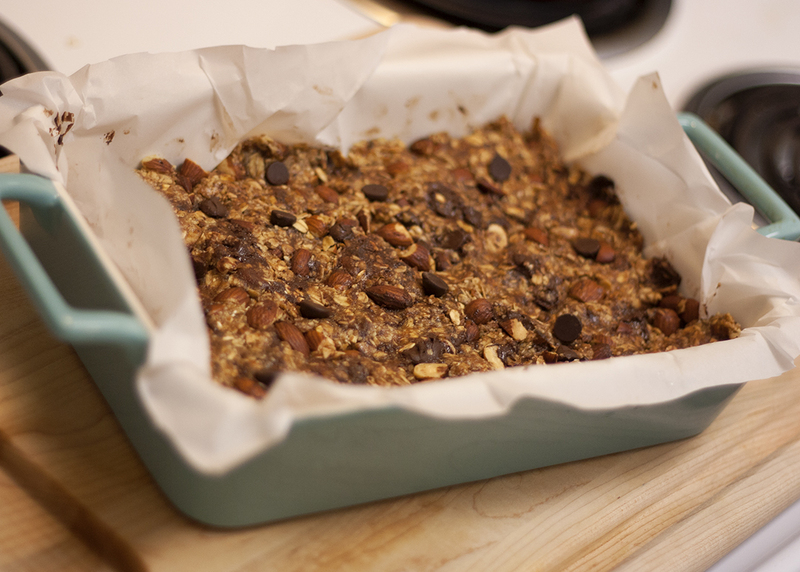 Cover the top of the mixture with more parchment paper or wax paper and refrigerate the bars for about 20 minutes. 8. After the bars have set, use a knife or pizza cutter to slice the bars into 10 squares. Store them in an air-tight container on the counter, or store them in the freezer to keep them extra fresh. 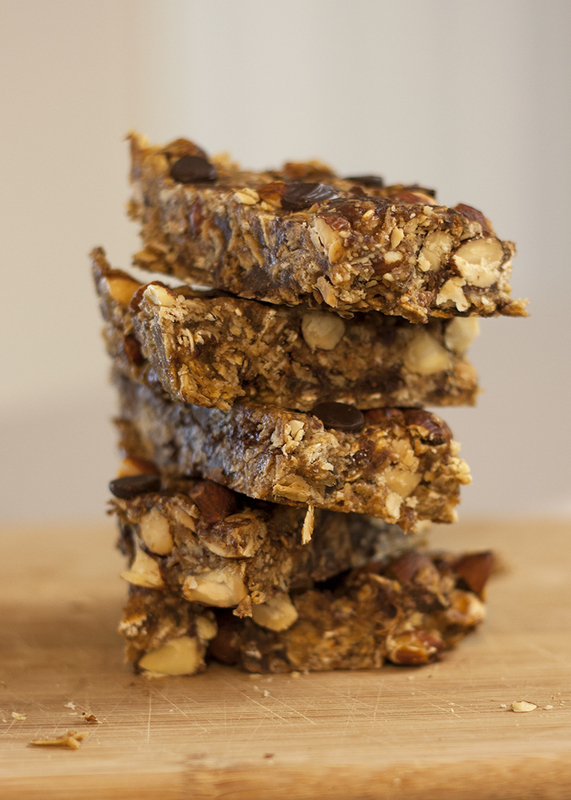 These granola bars are the perfect homemade snack. Enjoy!